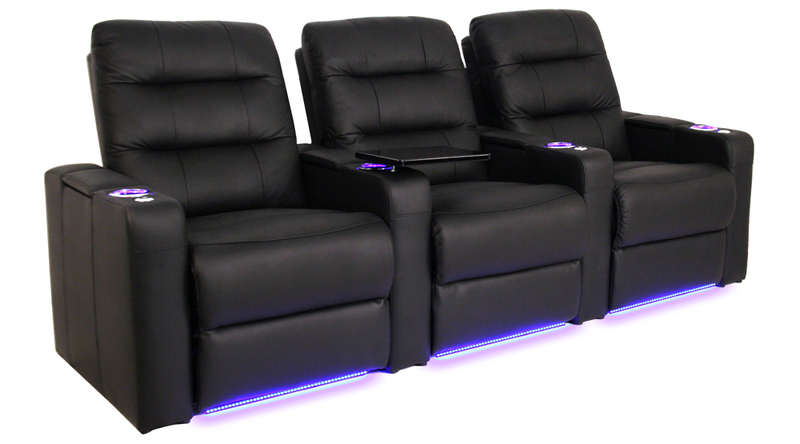 The Excalibur LX home theater seating from Seatcraft is as majestic as its name suggests. The backrest features a unique horizontal stitch pattern that creates an instantly appealing waterfall design. Cradling back support is abetted by many different color options, which maximize the seat’s décor applications. 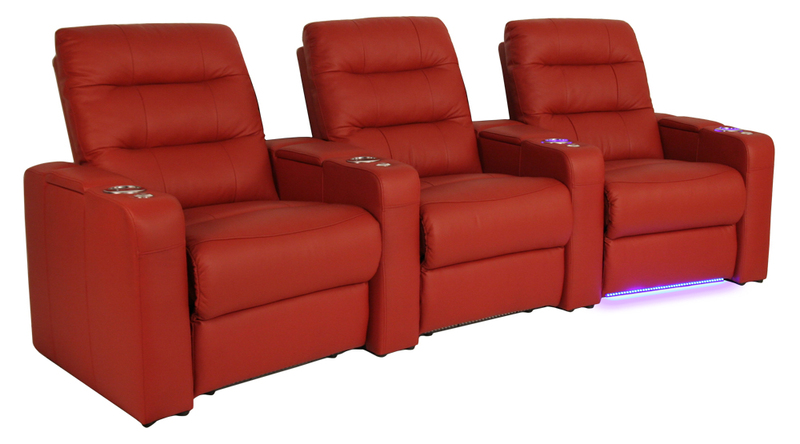 Wall-hugger seating allows the Excalibur to sit inches from any wall, even in full recline. 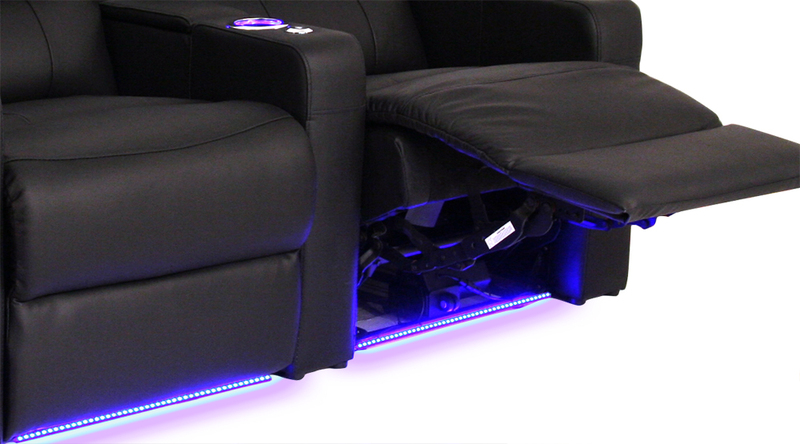 In addition, LED lighted cupholders and ambient base lighting provide a warm azure glow that beautifully accents the chair even as it guides movement in the dark. Meanwhile, a handy USB charging station lets you keep cell phones and laptops powered up. An accessory mount allows one to attach convenient upgrade options such as tray tables, tablet holders, and wine glass caddies. 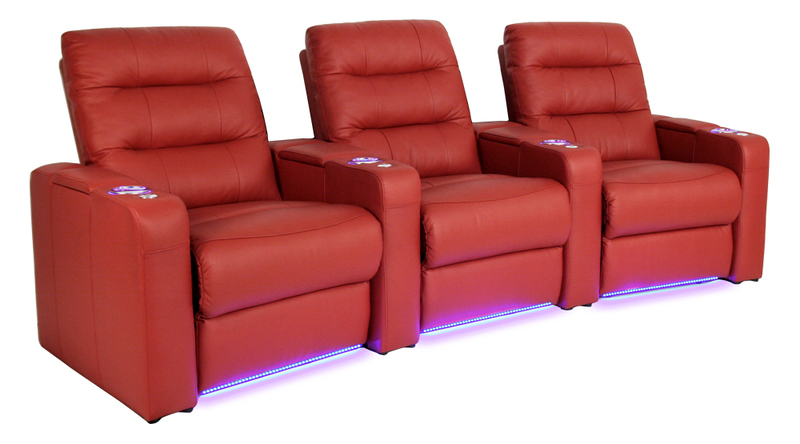 With its soft curves, elegant design, handy features, and top-grain leather material, the Excalibur will make a regal addition to any home theater. This optional USB charging station allows one to charge cell phones and other devices with ease. Increase the range of entertainment options at your disposal. Free included tray tables attach easily to the armrests. For the convenient placement of snacks, magazines, remotes, laptops, and any other items within easy arm’s reach. These cup holders have a special lighting feature which imparts a warm, azure glow. This feature allows the user to see their beverages clearly in the dark, while remaining discreet. An ample storage space, which is located within the armrest itself. 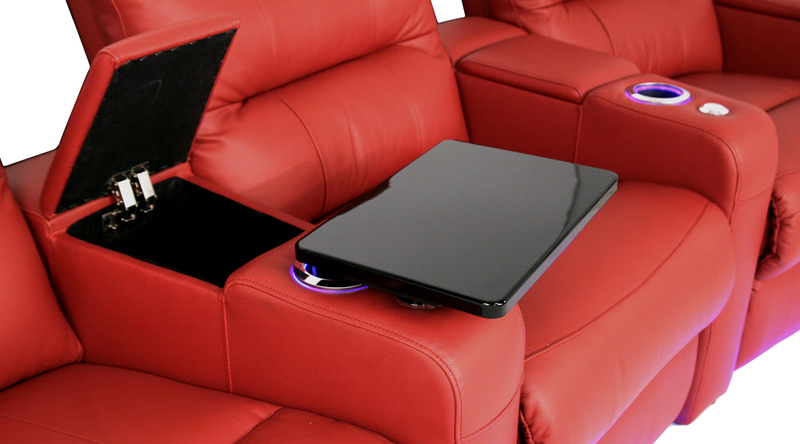 Simply flip the armrest back to place food, magazines, remote controls, or other items for their next use. This lighted sky-blue streak at the bottom of the chair provides a brilliant marquee accent, that is also useful for guiding anyone in and out of a darkened theater. For those searching for the many benefits of leather combined with the affordable value of other materials, bonded leather is literally the best of both worlds. This style was a way to present the look and feel of genuine full-grain leather at a fraction of the cost. This is because the material is actually a polyurethane-leather hybrid. Bonded leather is more durable than fabric, while providing many of the same advantages in look, texture, and feel as full-grain leather. In addition, the material actually has more consistency than full-grain leather, and is even easier to clean; just take a damp cloth to the material once a week, and it should look radiant for years to come. With bonded leather, you are sure to be fully satisfied by the range of attractions offered by its unique hybrid status. Bella fabric is an exceptionally smooth, silky material that is easy to maintain and projects a warm, inviting aura. Instantly soft to the touch, it’s available in a number of different solid color options that will match any theater decor. This fabric will caress your frame, transporting you to a state of placid relaxation in moments. Leather Gel has leather in the face of the fabric, and has significantly better wear and hydrolysis the most artifical leathers. This material exceeds 130,000 double rubs and the hydrolysis testing is over 5 years. With it’s current construction and backing this material is breathable. Leather Gel has the feel of a high-end leather but at an affordable price. It is also better for the consumer’s health by elimnating DMF. Top Grain Leather is one of the highest qualities of leather available on the market. Feel the difference of a richly textured material drawn from the outer hide of the animal, which heightens each of the senses in turn. The eyes will be attracted to its deep, mesmerizing grains, which are fully caressing to the touch; meanwhile, inhale the distinct aroma that only pure top grain leather can impart. This material is carefully buffed to remove any imperfections (variations in color, texture, etc. ), for a smoothly consistent look. Leather 7000 is, quite simply, the very finest leather you can pick for your home theater seat. This exclusive, luxury material is a type of top-grain leather that is painstakingly hand-picked from the top 30% of all cow hides, chosen for premium look and texture. Only the thickest, toughest, best looking, and most durable top-grain hides will do! 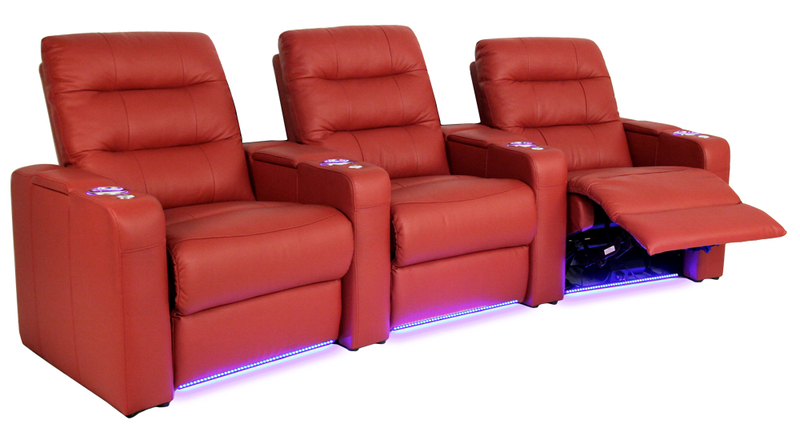 The leather is then carefully buffed to remove any imperfections or variations in color and texture, so that your home theater seat looks as swank, consistent, and inviting as possible.